Our upcoming January 10 Math Project Day and some of our student entries were featured in the Lexington Minuteman. RSM-Lexington Students Post Top Scores! See us in Lexington Patch! 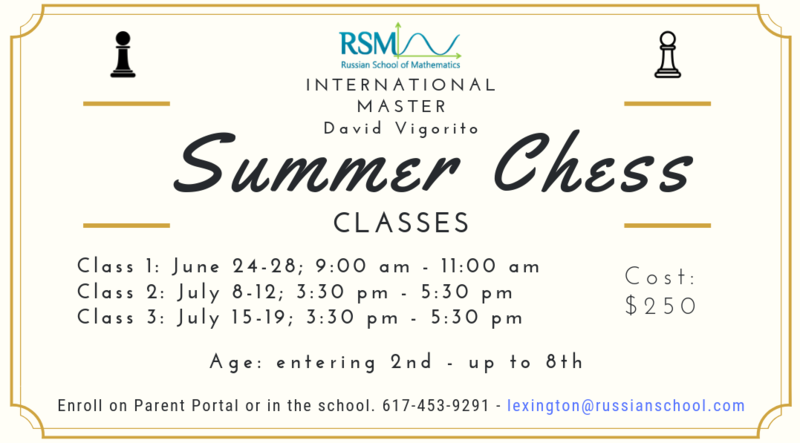 Why attend the RSM-Lexington Summer Math Program? Math in Action: For advanced high school students, courses in statistics and applied mathematics (with computer programming) provide real-world examples illustrating mathematics in action to analyze complex problems in the sciences, engineering, and business. Chess: Classes for students of all ages and levels, teaching strategies and techniques which will improve your child's level of play and help them develop an appreciation for the art and beauty of chess. 6 Weeks Summer School Session: June 24th- August 5th classes meet twice a week. 3 Weeks Summer School Session 1: June 24th - July 12th classes meet four times a week. 3 Weeks Summer School Session 2: July 15th -August 1st classes meet four times a week.